All too often house painting companies skip this very crucial step when painting exteriors. Unsuspecting home-owners can not tell the difference between a well prepared and primed surface, and a paint job that produces substrate protection for only a short period of time. It is important that you hire only reliable and established painters who have proven themselves over time. Drive by and see some of their model homes, contact references, and learn how long the painting company has been around. Raw wood is constantly trying to return to nature (rot). Wood surfaces breath and have a natural humidity of ten to fifteen percent. This humidly level fluctuates based on air humidity. When exposed to high humidity, dead wood will capture some water from the air. Living plants have microscopic pockets of water, but in dead wood, these pockets are consumed by fungai, and the walls between the pockets open up. This allows more moisture to be absorbed in the wood, providing more humid wood, which is more favorable to rapid growth of fungi, thus accelerating the decay of the wood. Priming is mandatory for exterior surfaces in our damp climate. Primer acts as sealant. It covers water stains, oil stains, and any other material that be be present on the substrate. 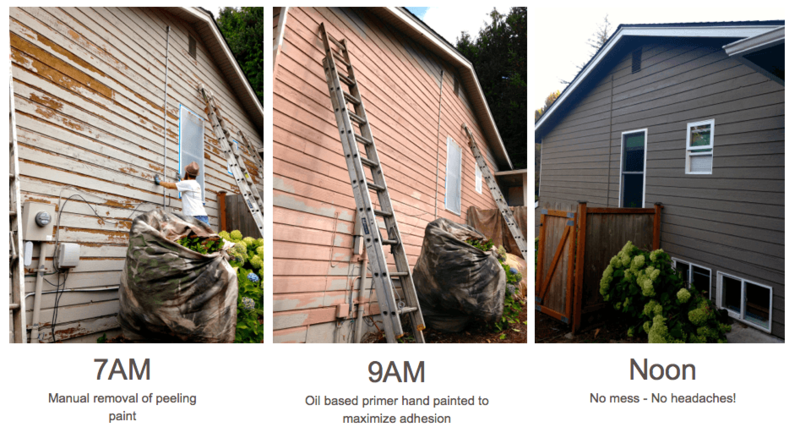 Wihtout primer, your wood siding is exposed to the elements. Primer is an under-coat applied before painting. Priming improves adhesion, increases durability, and is an excellent protector for exterior substrate. As paint dries, it undergoes chemical reactions. Water evaporates from paint as it cures. Primer controls the curing pace of finish paint and allows it to cure slowly while the chemical reaction is taking place. Please feel free to call, email, or text us if you have any questions about our procedures, or any of our do-it-yourself articles. We are not just a business, we are here to help. Posted in Procedures and tagged house painting, kirkland painters, kirklandh house painters, painting, primer, sammamish hosue painting, sammamish painters.